Alex Sanso signs print No. 1. Custom inscriptions beyond piece number and signature are available upon request. This commemorative print is now available in a limited edition of 50 pieces, each one hand-numbered and signed by the artist. It is available only through this website as the Friends of Fort Ward fall 2015 fundraiser. Each print measures 14 inches by 18 inches and is inked on archival-quality paper, highly suitable for framing and gift giving. Custom inscriptions beyond the piece number and signature are available upon request. Each piece is produced by John Arnsdorf of Bainbridge Island’s Studio23, and comes protected in a clear poly bag with acid-free cardboard backing. 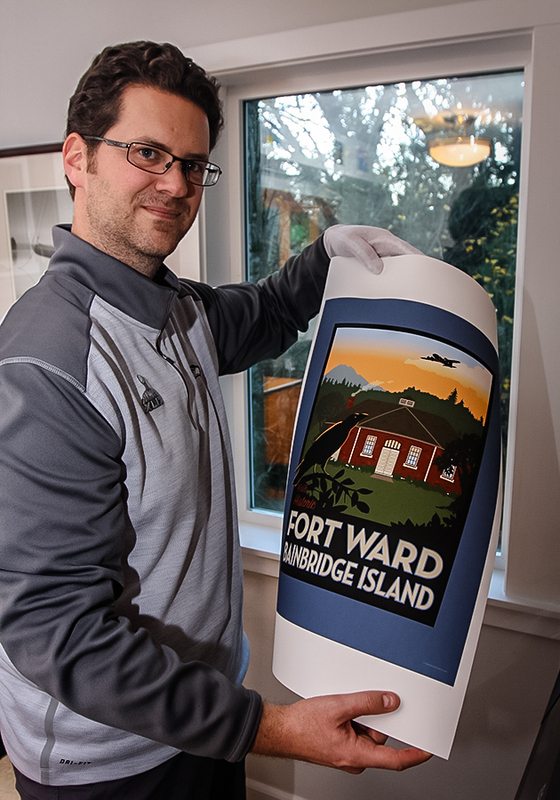 John Arnsdorf of Studio23 with the new Fort Ward bakery building print, hot off the press. 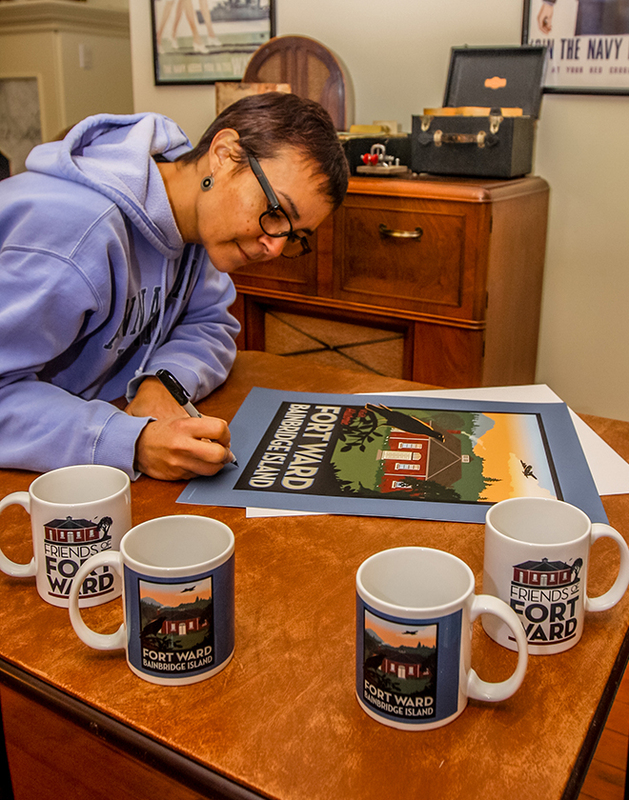 Cost per print is $100 plus tax, with all proceeds benefitting the Fort Ward Community Hall building restoration. Order your limited edition print by emailing fortwardhall@gmail.com, with PRINT in the subject line. The prints are a numbered edition, and will be fulfilled in the order that customer orders are received. Order today for a lower number in the series! Please make checks payable to “Friends of Fort Ward.” Your print will be delivered free of charge anywhere on Bainbridge Island; inquire for packaging and postage to off-island locations. 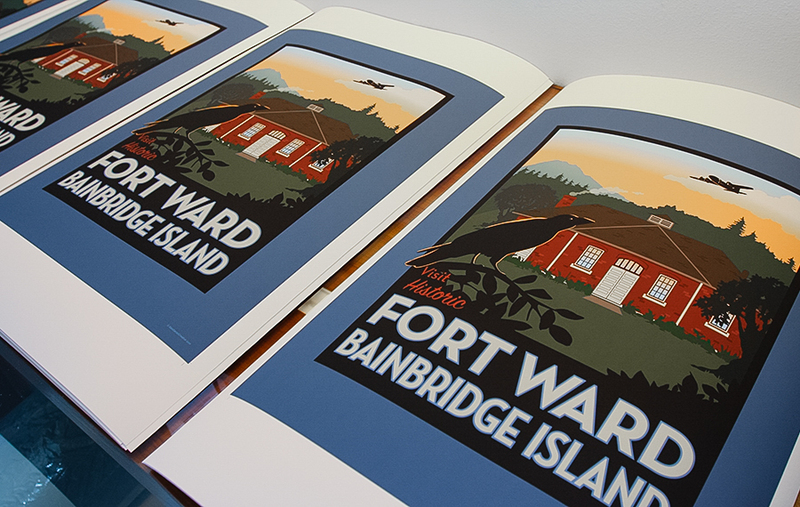 Commemorative Fort Ward prints as their ink cures, waiting to be trimmed to size at Bainbridge Island’s Studio23. As a matter of historical note, we should add that the airplane flying overhead in the image makes a nod to Puget Sound’s illustrious aeronautics heritage. The airplane is a representation of the famous Boeing 307 Stratoliner, which went into commercial service in 1940 offering the first passenger flights with the luxury of a pressurized cabin. Customers included Pan Am, TWA, and Howard Hughes. Some of the earliest 307s were also repurposed for military transport as the C-75 during World War II, and no doubt appeared in local skies during their period of development by our regional aeronautics giant.